It wasn’t too long ago that the hotelier’s marketing toolkit contained not much more than a few strategically placed billboards, travel agents armed with brochures, a good director of sales and an efficient call center. Today, hoteliers have more tools than ever for getting their property into the consideration sets of the brand-agnostic, DIY leisure travel shopper. Distribution now goes hand-in-hand with marketing and includes terms like “social media” and “search engine optimization” that didn’t even exist 20 years ago. And 20 years from now, these cutting edge channels themselves might be as quaint as your neighborhood travel agent. Distribution channels have become more complex and multi-dimensional as brands have developed powerful websites and online travel agencies have evolved from being strictly booking engines to also being media sites reaching tens of millions of consumers each month. 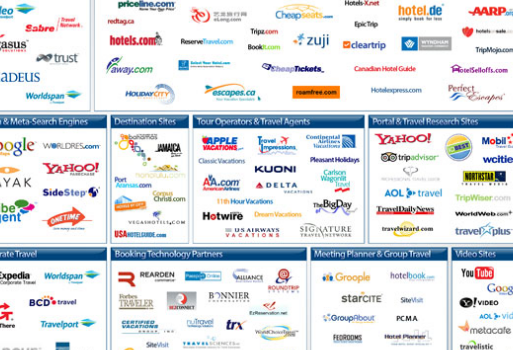 But all channels are not created equal, and neither is every hotel or every hotel brand. Each channel has different costs and delivers a different customer in a different timeframe. Wedding business books a year in advance; vacationers like packages and plan 90 days ahead; and a couple on a mobile device might be literally right around the corner looking for a room tonight. How can hoteliers keep up with the pace of change, and what do the innovations of today mean for the future of distribution? What follows is a discussion of key topics in hotel distribution today, the strategic considerations they raise, and their potential to change the future of distribution. Whether a quick weekend getaway or a two-week vacation of a lifetime, the journeys of most U.S. consumers start online. According to PhoCusWright’s Consumer Travel Report Third Edition, more than 50% of consumers use the Internet to initiate their search for the perfect vacation. Of those consumers, 38% begin their search on an OTA. As a primary gateway for travelers into the trip lifecycle, hotels need to be serious about search. Is their own website search-engine optimized? What is an appropriate search marketing budget? Is their participation with OTAs sufficient exposure? And as Google moves deeper into the travel space, what will happen to search marketing costs for hotels over time? This is especially important for smaller brands and independent properties whose marketing budgets might price them out of top placement in paid search products. • 60% of the world’s population owns a smartphone or other mobile device, according to PhoCusWright. • 116 million Americans were using mobile devices to access content and surf the mobile Web as of August 2011, a 19% increase over the previous year, according to comScore. And if those numbers don’t make you sit up and take notice, consider that in 2010 more than one-third of respondents to a PhoCusWright survey said they expected to use their smartphones to book travel sometime this year. This increased mobility demonstrates the need for hotels to be accessible across all platforms and to have a distribution strategy that includes mobile-only consumers. Mobile stands to revolutionize travel distribution in the same way the Internet did more than 15 years ago. • What is the most effective, affordable way to reach mobile customers? • What are the habits of mobile bookers that hotels need to understand? • How can independents play in mobile without an entire staff and an app development team? Social media is all the rage, and it seems as though there’s a hot new social channel emerging every day. But are social media outlets a distribution channel unto themselves, or are they merely a marketing channel? Clearly, social media plays a role in distribution in that it is an increasingly important influencer. Data show that hotels with higher TripAdvisor scores and better traveler reviews on OTA sites have higher conversion rates. And, while word-of-mouth advertising is nothing new, it’s never been easier to share an opinion, good or bad, with a global audience of friends and fellow travelers online. Whether in formal review submissions to OTAs and traveler reviews sites or in casual updates on Facebook and Twitter from their destination, travelers have made travel a social experience. • How are other hotels taking advantage of social channels? • Does a large fan base really translate into bookings? • How can I monitor, manage and influence traveler reviews? • Once I jump into the game, how do I keep the customer engagement and momentum going? • How do I effectively track and measure the return on investment of my social media efforts? Burgeoning demand from emerging growth markets makes international distribution a potential game changer for hotel owners and operators. International travelers book further in advance and stay longer than domestic guests, but marketing in another language can be a daunting and expensive endeavor. Furthermore, serving guests with different customs, habits and preferences can be challenging. With the emergence of new channels and rampant innovation across the travel industry, hotel marketing and distribution is becoming increasingly complex. But with a strategic view and awareness of the biggest areas of opportunity and impact, hoteliers can navigate smartly and position themselves for ongoing success. Faced with the fast pace of technological innovation and the increasing complexity of the distribution landscape, hotels should remember that success is a journey. The best things to do are to get familiar with new technologies, network with industry partners and colleagues, and test and learn.